What is the one factor that took your brand from good to great? Here’s a very compelling and honest story about who we are and what inspires us. Fabindia is a bridge that connects the rural craftsperson with the urban Indian consumer. We ensure that India’s rich cultural traditions, its crafts and the people behind them are celebrated across the geography of our great nation. Our products, while being anchored in the traditional knowledge of craft, are contemporary and of intrinsic value. We believe that Fabindia products beautifully integrate with contemporary lifestyles, offering alternate options in conscious consumption. And I believe that our story beautifully underpins everything that we do at Fabindia and is not just limited to our products. What role does technology play in making and keeping a brand hot? Technology plays many roles across the organization, infusing various dimensions with vitality. Technology also greatly aids in product improvement. Specific to the brand, technology is a key enabler in a brand’s endeavor to communicate with its audiences throughout their shopping journey. 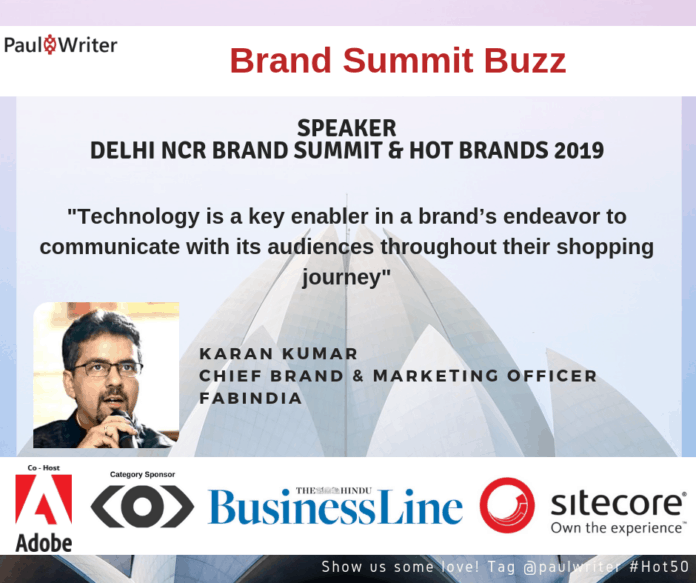 Product information, brand messaging, story-telling and audience engagement – all of them are either anchored in or enabled by technology in its various manifestations. Even in physical retail, technology is a key enabler of richer engagements between the brand and its customers. How has data become the essence of business/marketing? Data helps in making more informed decisions. While it comes in various shapes and sizes (or quantum), it is important for marketers to try and stitch individual data stacks together, ensuring that they talk to each other. This is most helpful when you want to harness the power of data to create and identify patterns, patterns that highlight issues and areas that need to be addressed. A more complete understanding of data also enables marketers to uncover insights, which in turn unravel newer business opportunities and spaces for the business to be present. What are your thoughts on the need for digital transformation? Digital transformation is a very macro subject and one that has many dimensions to it. Of course, it needs to happen and I believe that it is always on-going. With new discoveries and inventions every day, the evolution of digital technology, whether it is at an ERP level or at a digital marketing level, is a must for a brand to stay relevant to current conversations by plugging into them. This is possible only when organizations have a very clear understanding of where they are today and where they want to be tomorrow. That understanding fuels organizational strategies for long-term and sustained digital interventions on every side of their business.